Best of all Its Cheap! A Pop bottle bird feeder can attract lots of wonderful birds to your garden. Goldfinches are the most colourful birds found in England. People are often amazed when they look out of our window and see such brightly coloured birds in the garden. If you want to attract these beautiful birds a niger seed feeder is an absolute must. Goldfinch Feeders can cost anything from 13 to 25 pounds depending on the size and number of perches. This recycled plastic bottle feeder costs nothing! Another plus is that if you make a mess of your plastic bottle you can put it in the recycling bin and start again. 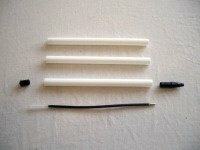 I use these stick pens when I make pop bottle bird feeders as they are usually very cheap and run out really quickly! They make great perches and hangers as when you take out the middle and the ends they are hollow, but strong. Its a great way to recycle plastic pens. Of course a plastic bottle that you want to recycle! 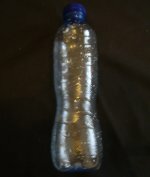 How To Construct Your Pop Bottle Bird feeder. Decide which way up you want your bottle to hang. 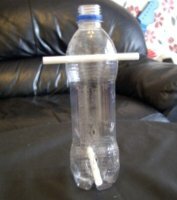 Then about 10mm from the bottom of your bottle make a hole with a compass or similar pointy thing! Use a big wood screw to make the hole bigger. Get a pen you haven't taken apart and wiggle it into the hole until it goes in easily. Poke it right through until it touches the other side and make another hole with your compass here. Do exactly the same thing to make another hole on the other side of the bottle. This makes a hole which you can push your dismantled pen through to make the bottom perch. Don't do that yet though! We need to make holes in the plastic pop bottle so that the birds can get to the seed. 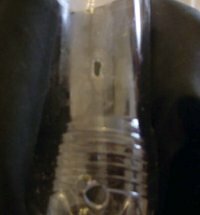 These holes In the plastic pop bottle need to be about 6mm in height and about 3mm wide. Measure 4.5cm from the top of the holes for the bottom perch you have just made. This is where you are going to make a hole for the birds to get the seed out. I use sharp side cutters to do this by pinching the bottle between my fingers and snipping off a 3mm strip. I then let the bottle bounce back and trim the hole into a nice neat shape. It's really important to make sure this hole is smooth as we don't want to hurt the birds! I use an old emery board to file the sides of the hole smooth. Repeat this on the other side of the bottle. If you don't want to do it this way you could use a sharp stanley or craft knife. Slide your dismantled pen into the bottom set of holes to make a perch. This should fit very snuggly so it doesn't let any water in. At the top of your pop bottle bird feeder make another set of holes the same as the ones for the bottom perch. Slide another dismantled pen through these holes and thread the washing line through to make a hanger. Fill your bottle with niger seed and hang it up in the garden. I hope it attracts lots of Gold and Green finches and you have had fun recycling. As you can see the goldfinches love my pop bottle bird feeder.